After starting debugging, the Debug panel **always** switches to the "Frames" tab. And then I **always** have to click on the "Variables" tab, to see variables. (because the first most interesting thing after starting debugging is variables, frames comes next). 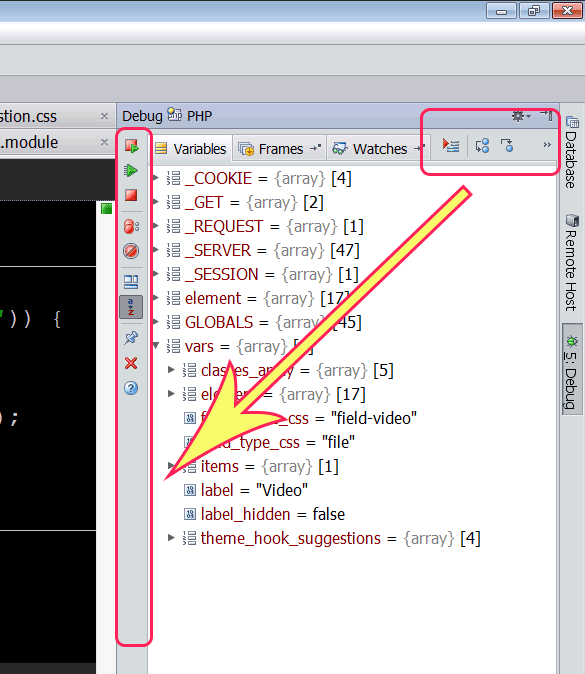 Is it possible to set it up so that after debugging starts, the active tab will be "Variables" ? 2) Right click on a tab and choose "Focus on Startup" -- just make sure that no other tab has the same selected already. "Focus on Startup" seems to not working. No matter what tab I set to "Focus on Startup", after starting debugging, the "Frames" is always auto-focusing as soon as any breakpoint is encountered. And I have "Focus on Startup" set **only** for the "Variables" frame, not for "Frames"
Yep -- it does not work here as well (v6 EAP). Either file separate ticket about this .. or just close Frames tab completely.